Creating custom address lists basing on custom attributes. 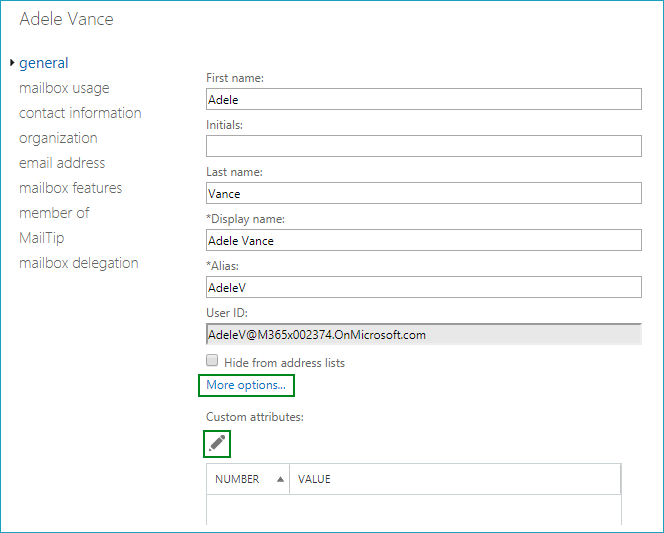 Adding additional contact details to Office 365 users. Those are only a few examples of use. Custom attributes can have many other uses, especially for admins who want to filter results of various PowerShell cmdlets. Before you begin using custom attributes, though, you have to set them up. Read on to learn how. 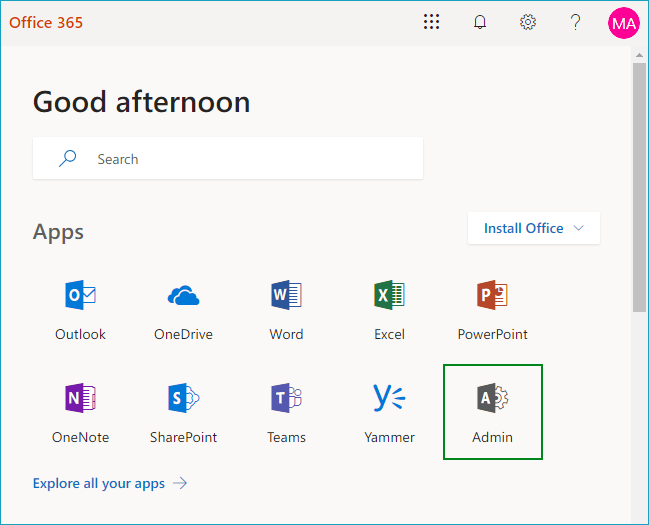 There are two methods you can use to set up custom attributes in Office 365: the Office 365 Admin Center, and PowerShell. 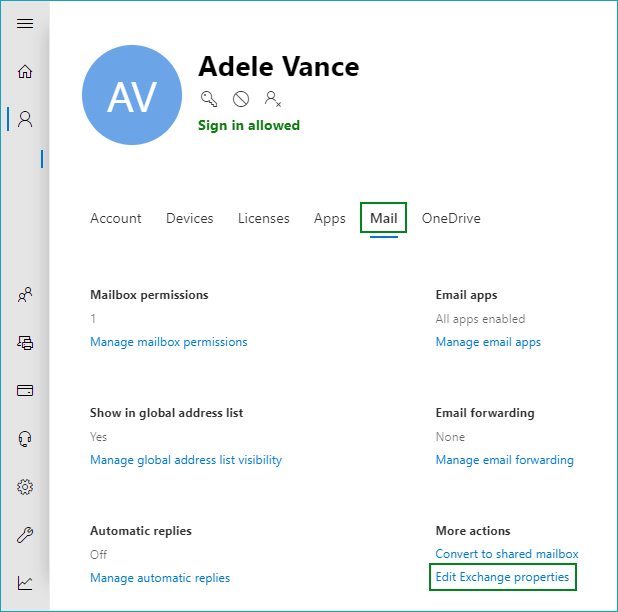 Another method – using Exchange Online admin center – will not get its separate section in this article. It is identical to the first one, except for a slightly different access path. Even though the first method makes use of a simple UI, you may find it much easier to use PowerShell (compare the two approaches below to learn why). 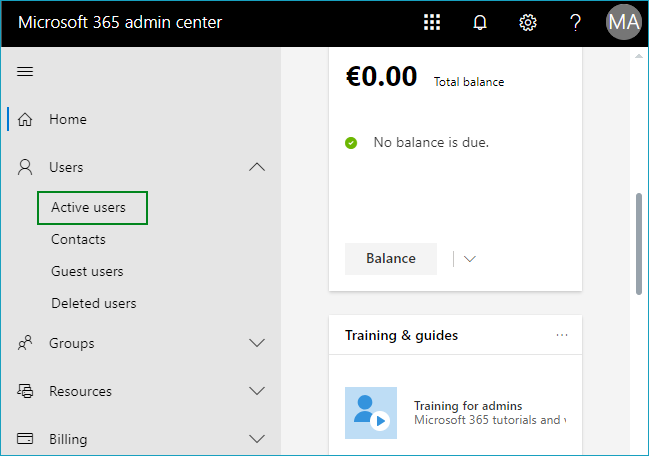 Log in to your Office 365 tenant and click the Admin app. Next, go to Users > Active users. Click the user with an active mailbox to access their properties. After that, go to Mail > Edit Exchange properties. Custom attributes are not visible until you click “More options”. After you expand the window to include additional fields, click the Edit. Finally, this is the window in which you can modify custom attributes for the selected user. As you can see, setting up custom attributes using PowerShell is much quicker than going through the UI steps. Especially if you need to change those properties in bulk. 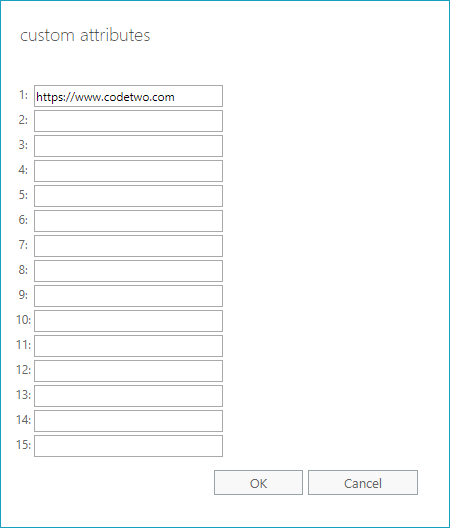 To make use of custom attributes in email signatures, you will need CodeTwo Email Signatures for Office 365. CodeTwo Email Signatures for Office 365 is an email signature management service. It allows you to unify email signatures and disclaimers in an organization, regardless of email clients and mobile devices used. Add one-click customer satisfaction surveys to your emails. One-click surveys are an easy way to collect feedback about your services from your customers. Most people are not willing to fill in a lengthy questionnaire about their customer experience. One-click surveys allow a much more friendly option of just clicking a rating button. Read more about CSAT surveys in email signatures. Provide scheduling links. A scheduling link in an email signature is a great way to make it easier for customers to book a demo or any other kind of meeting. Instead of troublesome back-and-forth emails to book time, you can automatically direct your customers to your or your team’s calendar. It is especially helpful if you and your customer reside in different time zones. Read more about the easy scheduling of meetings. Add additional contact details. In some cases, you need to add additional contact information or specific IDs to your email disclaimer. Using custom attributes, you can any kind of user-specific attribute to their email signature, automatically. Run A/B tests of your marketing campaigns. If you insert different links as users’ custom attributes, you can use the exact same email signature template with different banners and landing pages. As a result, you can easily let your marketing team test the effectiveness of their email campaigns. 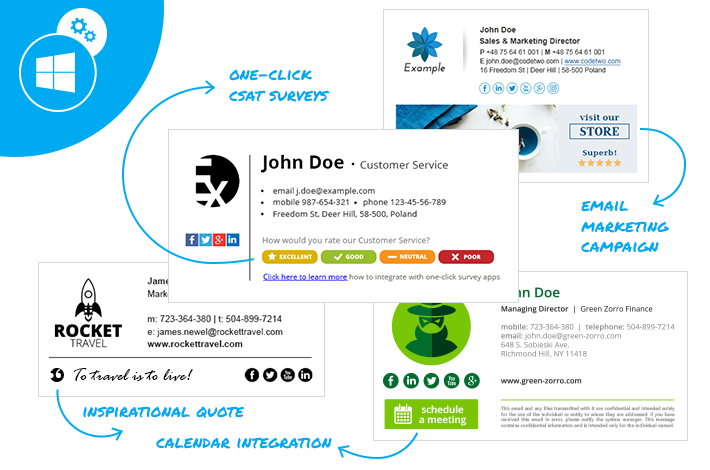 Email signatures are often a neglected aspect of communication in organizations. 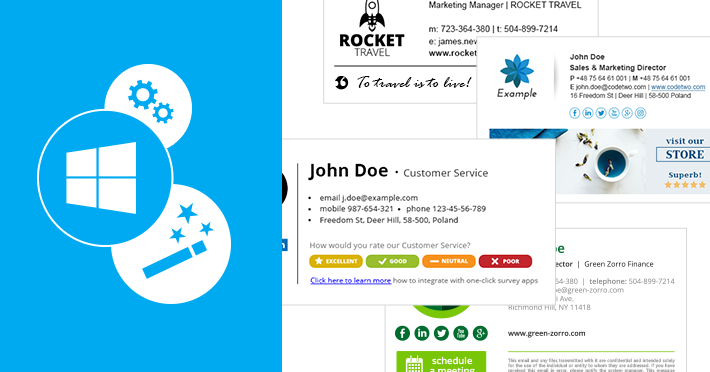 CodeTwo Email Signatures for Office 365 lets you upgrade your organizational email signature from an invisible addition to an invaluable, attractive asset. Build your branding and gain more marketing opportunities thanks to our software.